The Hall was demolished in the late 1950s and some of the stonework was used in the new bungalows on Hall Meadow Road and the closes off Kingsmoor Road which were built on the land formerly part of the Glossop Hall site. Its site is off Hall Meadow Road under what is now Old Hall Close. 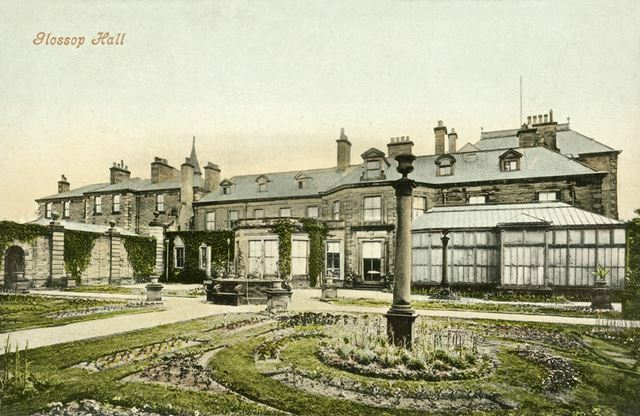 The main entrance to Glossop Hall was off the local section of Chapel en le Frith - Enterclough Bridge Turnpike, now called Norfolk St; there was a later entrance, post early 1860s, on Hall Meadow Road and these superceded around 1890, by a new entrance and lodge on Norfolk Street. (Additional information kindly supplied by Mike Brown).